The student movement at Birzeit University has always been an essential element in the University’s success and its distinctiveness. Birzeit became a university in the 1970s, during a period of vigorous popular political activity in the Occupied Palestinian Territory. Popular, broad-based institutions came into being, accompanied by maturity in the understanding of ways to mobilize the community on a continual basis to resist occupation: by paying attention to social and economic development in order to bolster the community’s steadfastness (sumoud); by instilling awareness of the importance of rejecting the occupation and collectively expressing the desire to be rid of it; and finally, by rallying around all effective initiatives whose goal is to resist the occupation. The context, then, was one of intense popular struggle. Birzeit University had the largest concentration of young people in the Occupied Palestinian Territory at that time. The student body included the elite among young Palestinians who hailed from towns, rural areas, and refugee camps in the homeland—the rich, the poor, and those in between. Student activism would not have been possible without an academic faculty and a University administration that were committed to serve the community and to interact with it and that believed in the maturity and awareness of the student body and their national commitment. Administration and faculty alike were convinced that giving students the freedom to work and organize gives free rein to their talents, ingenuity, and participation. Two features distinguish the role of the student movement at Birzeit. The first is related to the internal structure and the educational value that it entailed and its spirit of democratic pluralism and tolerance; the second is external and is related to the University and students’ participation in the national struggle and in the Palestinian internal political system. Since the early 1970s, students immersed themselves in organized union activism through the Student Council. The Council included various clubs (social, cultural, artistic, and voluntary work) plus five officers: a president, a vice president, a treasurer, an external relations officer, and a secretary. To this day, and despite the change in internal and external conditions and in the disposition and trends among students, the University has persisted in holding annual democratic elections, which are a focus of interest of Palestinian society as a whole. The results are considered a reliable indicator of the society’s democratic leanings and of the popular support the various political forces can claim to have. The balance of forces in the student movement underwent changes in concert with the changes in the national political map. In the 1970s, the main forces within the PLO gave priority to military resistance as opposed to grassroots work and to the external front over the internal one; consequently, leftist forces prevailed during student elections. The presidency of the Student Council was assumed by student leaders who were mostly leftists—Iyad Barghouti, Abd al-Karim al-Fayid (al-Kahyan), Asad Sinocrut, Ilham Khouri, Salam al-Saleh, and Bassam Salhi. In the 1980s, however, the political factions within the PLO moved toward grassroots work within the occupied homeland. Student Council elections during that time were won by students who belonged to the Fatah movement—Mufid Abed Rabbu, Nayif al-Suwaitat, Sameer Sbeihat, Marwan Barghouti, and Jamal Idris. The 1990s witnessed a decline in the popularity of PLO forces as Islamist political forces competed for popular support. As a result, Student Council elections during that time brought either Fatah or Hamas supporters to leadership positions. Despite these changes, the University preserved the integrity of the elections and held them regularly. The student movement, for its part, maintained an effective political role and a pioneering role in the struggle for national liberation, always willing to sacrifice and pay the price. Examples of this abound. During the uprising in the mid-1970s, the University initiated the organization of huge demonstrations, in which the wider public participated. This led to the arrest of the head of the Student Council, the deportation of the president of the University, and the University’s closure for a period of time. 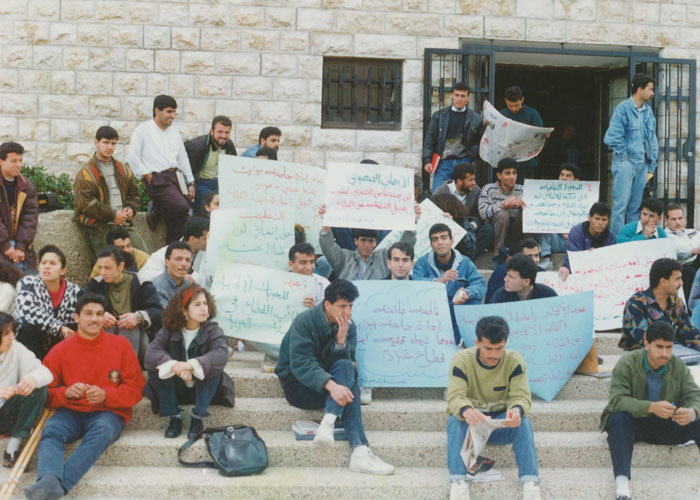 Closure became common in subsequent years until the University was closed for several years during the first intifada. The student movement’s role in the national struggle was both politically conscious and avant garde. It took the political initiative to organize a national conference on campus rejecting the visit of Egyptian president Anwar Sadat to Israel; it takes pride in this move, which had widespread participation, and in its rejection of the Camp David agreement. This eventually settled the debate within the Palestinian national leadership; the grassroots popular actions it triggered showed a political consensus that influenced the leadership’s position and contributed toward its adoption of the same position. The student movement at Birzeit participated in the National Guidance Council as a member representing all the student councils of Palestinian universities. The Council consisted of elected mayors, heads of grassroot worker and women’s organizations, and other groups that led popular and political resistance to the occupation in the second half of the 1970s. This excerpt, written by Ghassan Khatib, is taken from the ninth chapter of “Birzeit University: The Story of a National Institution.” You can read the chapter in its entirety by following this link. “Birzeit University: The Story of a National Institution” chronicles the development of Birzeit University by retelling the stories of those who helped establish it. In its three parts, the book presents the history of Birzeit University, from its early beginnings as an elementary school all the way to its present status as a full-fledged university, along with the challenges and obstacles that it faced during its time and its prominent role in the Palestinian community.